Damdami Taksal today decided to honour Mr Apar Singh Bajwa, a retired SP, who was instrumental in recognising and cremating the body of Sant Jarnail Singh Bhindranwale 21 years ago. A direct confrontation has started between the SGPC and the Punjab Government on the issue of raising a memorial in the Golden Temple complex to those who died during Operation Bluestar there in 1984. The district administration has recommended criminal proceedings against the firm supplying eatables to the district’s anganwadi centres, besides departmental action against the Zila Parishad Superintendent, CDPO, Maud, and the anganwadi in charge of Raikhana village. In the land scam case involving Chief Parliamentary Secretary Punjab, Rana Gumit Singh Sodhi, the land in question has been transferred in the name of the Jammu and Kashmir State Transport Corporation. Wife of former Congress MLA, Mahant Nirmal Singh, who at present is general secretary of the Punjab Pradesh Congress Committee was today booked by the Vigilance Bureau here under the Prevention of Corruption Act. The National Commission for Scheduled Castes has pulled up Punjab over the increasing custodial deaths of Scheduled Castes and incidents of crime against Scheduled Caste women. “Stop the maltreatment and arrest of farmers and members of their families for their failure to repay their agricultural loans,” says Dr Manohar Singh Gill, MP and former Financial Commissioner (Development), Punjab. The Department of Housing and Urban Development, Punjab, has allowed small colonisers in the state to extend their colonies or develop new ones without their acquiring completion certificates for their present projects. As many as 90 persons have died of AIDS in Punjab so far while there are 389 full-blown cases of this fatal disease in the state, says Mr D.S. Guru, Secretary, Health and Family Welfare. The Communist Party of India today questioned the secular credentials of the Congress, “which has been competing with the Shiromani Akali Dal and the SGPC on a religious turf”. “In spite of being a secular party, the Congress is using religion for political purposes, which is contrary to its principles. The secretary of the Punjab unit of the CPI, Dr Joginder Dayal, said yesterday that the foreign “jaunts” of the Chief Minister, Capt Amarinder Singh, and his “ army” of Ministers and bureaucrats had proved a huge drain on the state exchequer. The SAD will soon released details about corruption practices followed by the Congress government in the state in two different phases. We have collected all documents pertaining to the involvement of Capt Amarinder Singh and his officers, said Mr Sukhbir Badal, MP and SAD general secretary, while addressing a press conference here today. Residents of Jalandhar are exposed to varied diseases as they are forced to consume unstamped meat in the absence of any government-run slaughter house. Though the local Municipal Corporation has been subjecting daily arrival of thousands of animals, meant for slaughter, to octroi, yet the civic body has not done even a bit to regulate meat production. Unhappy over the lack of government support to the turban issue in France, the Shiromani Gurdwara Parbandhak Committee has initiated direct liaison with the French government in this regard. Keeping in view the rise in the accidents on the National Highway-21 passing through the district, health services in government hospitals need improvement, besides strict implementation of the traffic rules. Ms Balwinder Kaur, a handicapped teacher, has been running from pillar to post to get justice after being subjected to victimisation by her husband and other kin for bringing less dowry but without any success. Residents of Indira Colony here blocked traffic this evening on the Dalhousie road against police inaction in an alleged kidnapping case. The residents alleged that Gulshan Kumar a resident of the colony, was in the habit of investing in the daily lottery scheme. Lambasting the administration at a khula darbar held at the Canal Rest House Complex here today, Mr Sunil Jakhar, Parliamentary Secretary, Punjab, observed that right from a peon to senior officers, the administration had by and large become non-responsive. The All-India Bairagi Mahamandal will observe 289th martyrdom day of Baba Banda Singh Bahadur at a function to be organised at Shah Auditorium in New Delhi on June 9. Among other dignitaries, the Chief Minister of Delhi, Ms Shiela Dikshit, will also attend the function. The Saragarhi Memorial and Etho’s Promotion Forum has urged the Punjab government to check the reported sacrilege of Saragarhi memorial at Ferozpore Cantt and has also demanded immediate demolition of unauthorised construction to restore the sanctity of valiant soldier’s memorial. The Prime Minister, Dr Manmohan Singh, has assured the SGPC President, Bibi Jagir Kaur, that the government was committed to starting a bus service between Amritsar and Nankana Sahib at the earliest to fulfil the aspirations of Sikh devotees to the shrine. With the Takh Sri Damdama Sahib management calling the task force from the SGPC, Amritsar, in the wake of the conference of the SAD (Amritsar) to commemorate “martyrs” of Operation Bluestar in Talwandi Sabo tomorrow, the situation has become tense here. 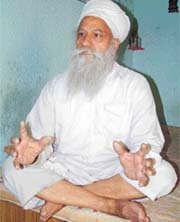 A huge crowd of Sikhs of about a half dozen villages today forced Sukhdev Singh and Pakhar Singh, followers of the Divya Jyoti Jagriti Sansthan of the self-styled godman Baba Ashutosh of Noormehal, to cancel a religious function of the Noormahlias sect at their residence at Domeli village, 15 km from here. In view of the ongoing lootings, theft and burglary incidents in the district, Ms Jaspreet Talwar, District Magistrate, has issued orders to start night patrolling by the village defence committees to guard towers, transmission lines, substations, transformers, railway lines, government buildings, foodgrain storage complexes, petrol stations, canals, bridges, banks, post offices in their respective village areas. Various aids were distributed among disabled children at a function organised at Khalsa Senior Secondary School here today. As many as 579 children from Ropar district were given items which included tricycles, wheelchairs, crutches, hearing aids, artificial limbs, etc. The Punjab and Haryana High Court yesterday ordered status quo in the matter of sale of holiday homes owned by the Punjab Tourism Development Corporation to a UK-based businessman. Bathinda’s Additional Sessions Judge D.R. 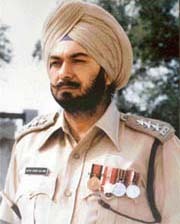 Arora has ruled that Punjab’s former Minister Sikander Singh Malooka and his family had not been defamed. In a case against three Bathinda residents, the Judge further ruled that they could not be charged for defamation hence discharged. A local court today extended the police remand of two of the five persons arrested by the Kharar police on May 25. The police had nabbed five members of a notorious inter-state gang of burglars and vehicle thieves. It could well be called a clip from a Hindi flick.The attempt to murder case by setting a person ablaze has taken a dramatic twist after a police probe. It turned out to be a typical case of inflicting self-injury in order to vainly blackmail a woman friend into physical relations,well-placed sources told this correspondent today. A poppy husk smuggler got injured in an encounter with the police last night. Out of the three smugglers who escaped after the encounter, two were arrested by the Nehiawala police along with the poppy husk and the car used for smuggling. The police today arrested four armed youths while they were allegedly planning to loot a bank. According to Mr Rachpal Singh, DSP, the arrested youths were identified as Harmeet Singh, alias Preet, son of Pal Singh of Shastri Nagar, Gurpreet Singh, son of Ishar Singh of Janta Nagar Dhuri, Tarsem Singh, son of Karnail Singh of Kaheru, Pardeep son of Surjeet Singh of Sunder Nagar Basti, Sangrur. One person was killed and another was injured in a reported bid to take over the Truck Union here. Sources said today that the union’s lawyer, Jagdev Singh Rampura, Narinjan Singh Vaid and their armed supporters allegedly attacked the men belonging to the union president Gurdev Singh Sidhu’s group. Farmers belonging to more than 50 villages around Fatehgarh Sahib have been duped by a commission agent firm of Sirhind Mandi of worth more than Rs 10 crore. One of the affected farmers, Surjeet Singh of Balahra village, which is the worst affected village, died today due to a heart attack as no other commission agent was ready to have him as customer. Karam Chand, SDO, Punjab State Electricity Board, was today caught red-handed while accepting a bribe of Rs 5,000 from Mr Harbhajan Singh. In a press note issued here, Mr Amrik Singh, SSP, Vigilance Bureau, Bathinda Range, said Karam Chand was posted in the Kot Shamir subdivision. Though the Deputy Commissioner has issued orders for night patrolling to prevent thefts in the district looters struck late this evening and succeeded in looting two of the three wine shops they targeted. The Deputy Commissioner, Gurdaspur, Mr Vivek Pratap Singh, has ordered the demarcation of the land of Government Senior Secondary School, Lamini. The order has been issued after the matter of cutting of more than 100 eucalyptus trees was reported. Dr Jagtar Singh, Head, Department of Library and Information Science, Punjabi University, has been elected member of the Standing Committee of the International Federation of Library Associations in the Information Technology Section for a period of 2005-2009.